This book will be of considerable interest to economists and to econometricians concerned about the methodology of their own discipline, and will provide valuable material for researchers in science studies and for teachers of econometrics. 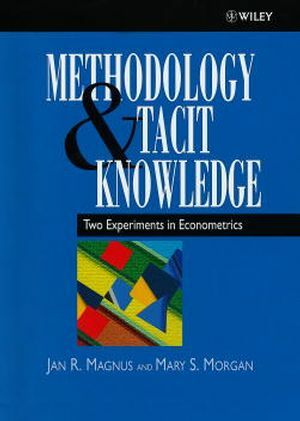 Jan R. Magnus is the author of Methodology and Tacit Knowledge: Two Experiments in Econometrics, published by Wiley. Mary S. Morgan FBA FRDAAS, is Professor of the History of Economics in the London School of Economics since 1999. She graduated from the London School of Economics a Bachelor of Science in Economics in 1978 and a Doctor of Philosophy in 1984. Introduction: Applied Econometrics and Design of Two Experiments (J. Magnus & M. Morgan). Organization of the Field Trial Experiment (J. Magnus & M. Morgan). A Statistical Demand Function for Food in the USA (J. Tobin). On the Correspondence Between Individual and Aggregate Food Consumption Functions: Evidence from the USA and the Netherlands (H. Anderson & F. Vahid). The Demand for Food in the United States and the Netherlands: A Systems Approach with the CBS Model (H. van Driel, et al.). Revisiting Tobin's 1950 Study of Food Expenditure (E. Leamer). Empirical Econometric Modelling of Food Consumption Using a New Informational Complexity Approach (P. Bearse, et al.). A Comparative Study of Modelling the Demand for Food in the United States and the Netherlands (H. Song, et al.). Statistical Demand Functions for Food in the USA and the Netherlands (D. de Crombrugghe, et al.). The Dynamics and Statics of Food Consumption: Tobin Revisited (R. Hoglung, et al.). Tobin's Study on the Demand of Food in the US Revisited: An Examination of the Issue of Pooling Information from Budget Studies and Time Series (G. Maddala, et al.). My 1950 Food Demand Study in Retrospect (J. Tobin). Comparative Assessments of the Field Trial Experiment (A. Barten, et al.). Analysis of the Field Trial Experiment (J. Magnus & W. Siegert). Lessons from the Field Trial Experiment (J. Magnus & M. Morgan). Organization of the Tacit Knowledge Experiment (J. Magnus & M. Morgan). An Application of Three Econometric Methodologies to the Estimation of the Income Elasticity of Food Demand (W. Siegert). An Econometric Analysis of US Food Expenditure, 1931-1989 (D. Hendry). Is this How I Look? (E. Leamer). The Tilburg Experiments: Impressions of a Drop-Out (A. Pagan). Lessons from the Tacit Knowledge Experiment (J. Magnus & M. Morgan). Description of the US Data (J. Magnus & M. Morgan). Description of the Dutch Data (J. Magnus & M. Morgan).